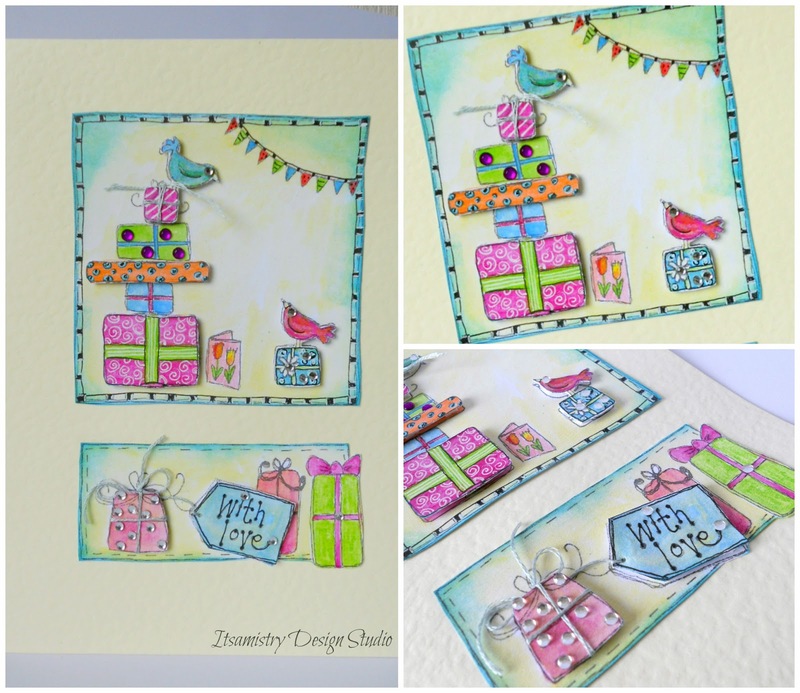 Welcome to the first ever Midweek Papercraft Party here on Handmade Harbour! 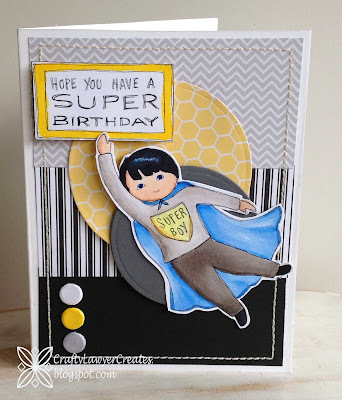 This is a challenge-type party you can join in, if you enjoy papercrafting. There's more info at the end of the post if you'd like to take part. Most weeks we'll have a theme, but this week it's Anything Goes - so you have no restrictions at all - you just need to make something using paper! First up, let's have a look at what some of the design team have been creating! 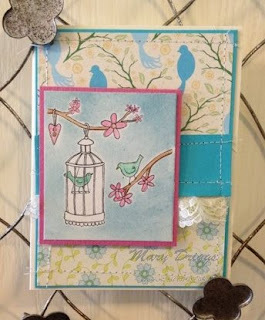 Mary's made a really pretty card from the birdcage in branches digistamp. I love the pink and blue colour scheme she's used here - just gorgeous. 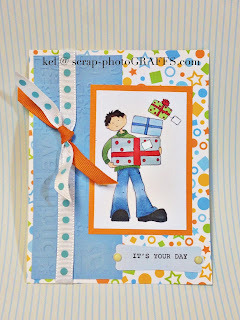 Speaking of colour, this card (below) by kel is another one using a colour mix I love. The orange and blue with touches of green and red looks so fresh and it's just a brilliant card - simple but very effective! It's been made using the boy with presents digistamp. I love what Laura's done with colour too (has the design team been reading up on my favourite colours?) The red dotty accent used with blue and white on the cute birdy card (below) is just so me - and the floral background adds a pretty and vintage-style touch. 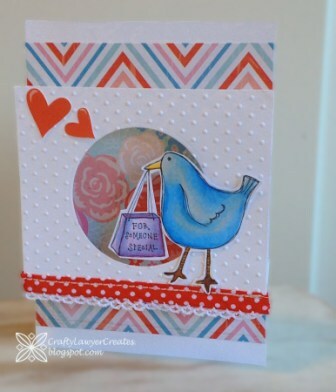 Laura's used the bird with shopping bag digi stamp for her card and a super job she's made of it too! OK, so perhaps the superboy card needs a girly project to balance things out? How pretty is Connie Hall's ballerina scrapbook page? This is so gorgeously girly and feminine - a very special page for some very special memories! 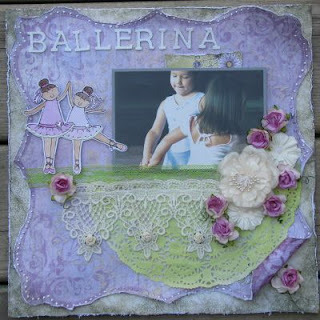 Connie's used my little ballet dancers digistamp on her page. A fabulous use of the image, I think. 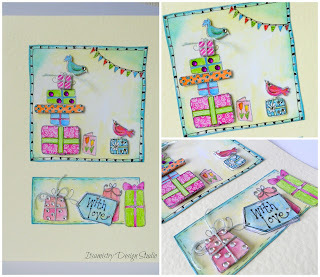 Look at the colours in Anita's card (below)! I love how the contrasts she's used make her colours really pop! Anita's been keeping a secret from me - I'll let you find it out when you pop over to her blog. It really doesn't matter though - I've seen Anita's work in person, as we often did the same craft fairs in the past. 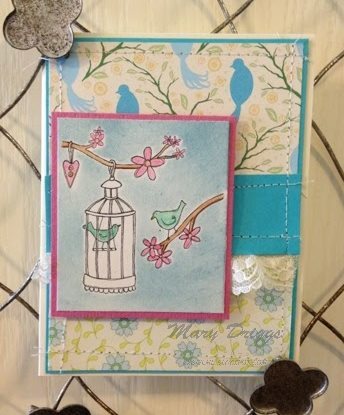 I know everything she makes is of a really high standard as well as being full of colour and zing - just like her card (below) made from the birds and gifts digi stamp, (which actually is 10 stamps in 1 - amazing value, when you think about it!). 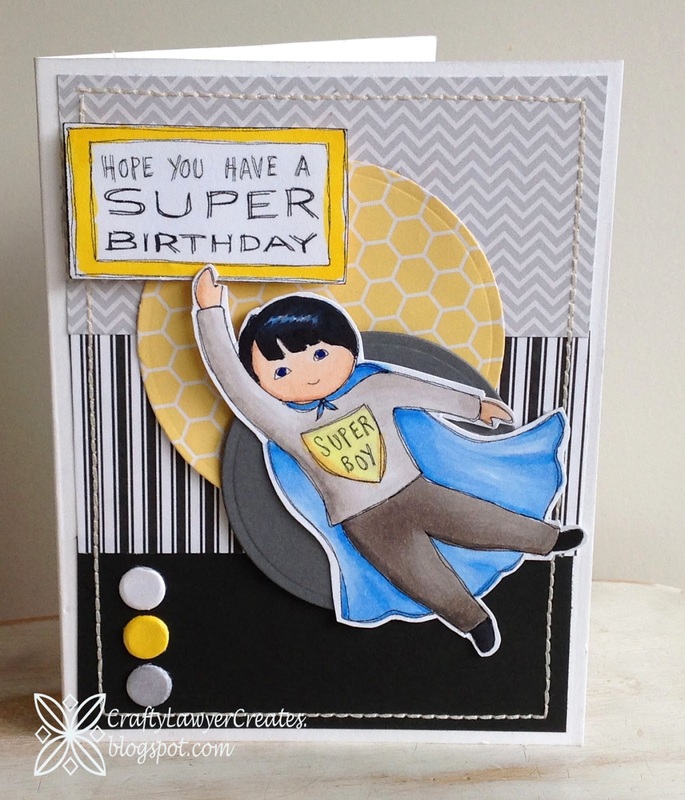 You blog about a papercraft project you've made: cards, scrapbooks, wall art - well, anything really. You link up to this blog post using the easy-to-use linky tool below (please be nice and include a link back to Handmade Harbour's blog in your post - or add the Handmade Harbour shop button on your blog). Keep it current - please don't link to old posts. If you use a Handmade Harbour digital stamp, you'll be eligible to win a prize (three free digistamps of your choice from the Handmade Harbour shop). The design team will be taking turns to choose a winner each week. It might not always be the slickest, most professionally-executed design which wins but it will be something which appeals to that week's judge in some way... use of colour, usefulness of a tutorial, innovative or different use of materials...etc. - so everyone is in with a chance of winning, even beginners. You can still join in without a Handmade Harbour image, but you won't be eligible for a prize. You can use a Handmade Harbour image without making a purchase - there's a free digistamp you can use. There's another way you can get a free digi stamp, by placing a Handmade Harbour blog button in your blog sidebar - click the link for more details. We'd love to have you take part! This week's theme is Anything Goes so you don't actually have to stick to a theme at all (but themed challenges are coming up soon!). Have you been inspired by any of the design team makes? Have you got a favourite? And are you joining in with the papercraft party this week? We'd love to see what you've been crafting from paper!